Something I’ve been working on the past week, and probably will be for another month or so before it’s completed. 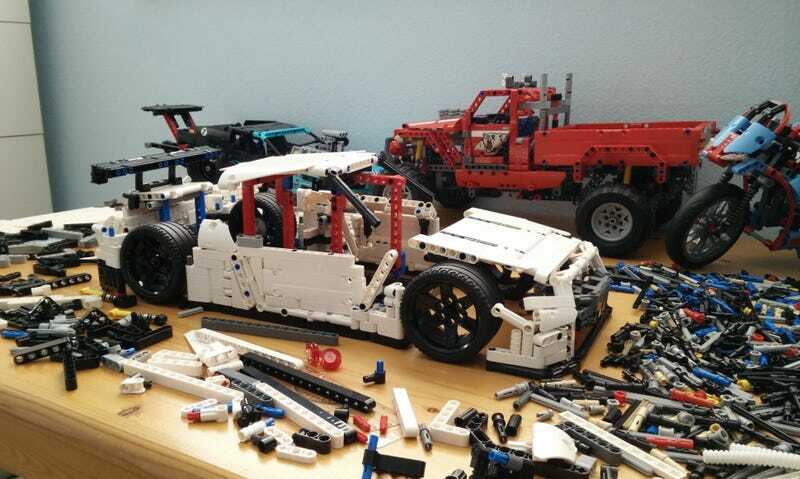 I’ve been accumulating a bunch of Lego Technic sets to get a feel for the techniques and also to amass some more parts for this project. I’m sure you all can guess what car this is, seeing as you are all avid gearheads. Currently, I’m waiting for some parts to arrive, and in the meantime I’ll be working on the chassis and gearbox. This is approximately what the outer shell (still incomplete) will look like. I’ve simulated the placement of the roof with some randomly colored beams that will be gone in the final model. The ultimate plan is to have this as a fully-working RC car with gear shifting controlled by remote. I have a lot of research and experimenting that I need to do before getting to that point, so we’ll see. I may throw in automatically opening doors, hood, and trunk if there’s enough space in there. And of course, most importantly, the car has to remain true to the 1:1. The proportions have to be right and the detail needs to be extensive, including a full interior and engine bay. Oh, and as with the real thing, it needs to be AWD.